The New York Times reported on a dilemma facing bat populations in the Adirondacks, the largest bat hibernaculum (winter resting place). Bats are leaving hibernation early, showing signs of what I perceive as weakened immune systems, and other symptoms that have not been identified yet. This is confusing to those witnessing the demise of the local bat populations. The article states that researchers from institutions like the Centers for Disease Control and Prevention, the United States Geological Survey’s National Wildlife Health Center, Boston University, the New York State Health Department and Disney’s Animal World are assisting to identify and mitigate the problem. It has been a while since I’ve worked with bats but the onces I worked with were highly endangered Rodrigues Fruit Bats when I worked for the Durrell Preservation Trust in England. Rodrigues is a small island off the coast of Mauritius which is near Madagascar. The bat breeding program was the first of its kind because the species had never before been kept in captivity. 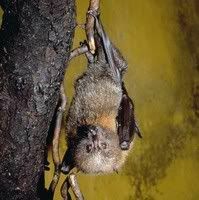 The reported threat is to insectivorous (insect eating) bats housed in the hibernaculum which has sheltered about 200,000 bats in past years according to the NY Times–mostly little brown bats (Myotis lucifugus), federally endangered Indiana bats (Myotis sodalis), and small-footed bats (Myotis leibii). It is suspected that new pesticides are contributing to the problem. Since some of the animals have been found to be emaciated this may be the case but I think it is probably going to be attributed to more than that. When populations get too large, disease is more likely to run through the population strengthening the genetic pool. Environmental factors, pollution, diseased food sources can all contribute to the issue. If the local food sources (insects in this case) have been poisoned and also reduced this would be a real concern. Anyway, it will be interesting to see what the scientists come up with. Read more in the Bats Perish article.